Lake Side Mobile Estates Lake Side Mobile Est Homes: Nantucket Mews, the newest home for sale in The Island Cottages in a Naples Bay Village. Construction to start end of March and home should be complete by end of October. A unique porte cochere home with ample outdoor living space in the heart of the Bayshore Arts District! 3 bedroom, 2 bath with attached 2 car garage, upgrades galore, and incredible landscaping. Pool/spa options available. The Island Cottages in Naples Bay Village is an infill community built in the Florida cottage style with large porches to take full advantage of outdoor living. More attention to detail and custom finishes than other new homes in the area. This new walkable community is near Celebration Food Truck Park, The Botanical Gardens, 360 Market, Sugden Park, the Bayside waterfront park and boat launch, and so much more! Many more opportunities available for new custom luxury homes from 449k-600k+ including waterfront. Lake Side Mobile Estates Lake Side Mobile Est Homes: LOCATION! LOCATION! LOCATION! Where can you find a totally updated 4 bedroom, 2 bath home only 3 miles from downtown Olde Naples & the white sugar sand beach at this price? In popular Bayshore Redevelopment District. Wood Plank Porcelain floor tile throughout. Dark Cherry cabinets in kitchen and baths with gorgeous Granite countertops/vanities, lovely backsplashes. High Energy Air Conditioner with 10 year warranty which can be controlled from your telephone, & Eco Smart Tankless water heater are 1 year new. Nest Thermostat improves efficiency of the air conditioning. Stove & Refrigerator 2008, Microwave 2015, Washer & Dryer 2016. Appliances have a 5 year warranty. New interior doors. Newer Shingle roof. Crown Molding and 5 1/4 baseboard. .16 Acres and Large Fenced backyard.Concrete Pad back yard can be used for patio, RV, camper, boat. New Single Family homes on St. LOCATION-1 block to the Naples Botanical Gardens, for boaters few blocks to Bayview Park Boat Ramp. Walk to East Naples Community Park-home to the Minto US Open Pickleball Tournament-World Class Event, and offering tons of activities for all ages. Near Sugden Regional Park. ONLY 3 miles to the sugar sand Gulf Beach. 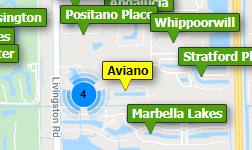 Need professional assistance selling your property at Lake Side Mobile Est Naples? Find out how an Area Specialist can help to generate more property exposure in order to get the most money for your investment in the least amount of time.